Retro Review Month enters the world of reploids with Mega Man X and his second entry. Mega Man celebrates 25 years alive in gaming, and I am going to put on my party hat and join in on the fun, too. First we have this review of Mega Man X2, one of the more popular games in the series. If you missed the original Mega Man X's retro review, catch it right here. 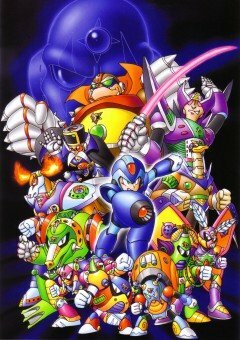 My personal favorite Mega Man series of the seven: Classic, X, Legends, Zero, Battle Network, ZX, and Star Force would have to be the Mega Man X series. While it hasn't been of consistent quality in later installments (particularly X6 and X7), it has delivered a huge amount of entertainment for me for the games that are incredible. Joining Mega Man X and Mega Man X4 in the upper echelon of X titles is Mega Man X2. Even today there are heated conversations over which of the Super Nintendo X trilogy is the best. 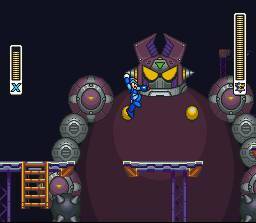 Is Mega Man X2 twice as good as its predecessor? It has been six months since Mega Man X and Zero led the charge to defeat Sigma and his Maverick minions. Now X and his fellow Maverick Hunters are wiping out the last of the Mavericks. Is this truly the end of Sigma and his followers? Spoiler: Well, the tail end of Mega Man X heavily hinted Sigma's return, so no, the Mavericks are nowhere near finished. With that out of the way, X not only has to worry about cleaning up after Sigma's mess, but he also has to deal with a trio of self-proclaimed X-Hunters who are targeting the idealist reploid. The story of Mega Man X2 is a cut above X1. The characters are more fleshed out while the story is more involved. More Mavericks just means more target practice for X. If you are anyway familiar with Mega Man X or even the Classic Mega Man series, then you know what to expect. You have eight stages that you can choose to tackle in any order, the defeated Maverick boss with names like Crystal Snail, Flame Stag, and Morph Moth give you their signature weapon, and that weapon is used to reached inaccessible areas in levels as well as utilized as the weakness of one of the other Maverick bosses. For instance, Bubble Crab doesn't take too kindly to Wheel Gator's weapon. To have the least difficult time through the game, there's a recommended order to go through so you can use each Robot Master's weakness on them to defeat them without as much hassle as you would if you fought them with just your X-buster. However, it's also enjoyable to go out of order and make it more of a challenge for yourself, too. The Sonic Slicer deals serious damage to Overdrive Ostrich. 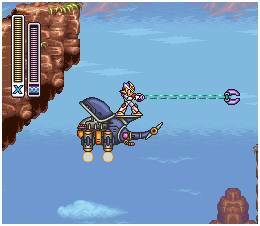 There's more things to collect and do in Mega Man X2 than in the original Mega Man X. Yes, there is still one health-increasing Heart Tank in each Robot Master stage, and there is one of four Sub-Tanks that can be used to heal yourself mid-battle that are placed in special out of the way spots in the game as well. Dr. Light's many capsules return, hidden away in alcoves and other areas. Each capsule upgrade bestows X with an armor upgrade. One can allow X to charge and unleash his shots for a huge attack increase (compared to his normal charged shot anyway) while another gives him the ability to dash while midair, a series first. Then there's the matter of Zero who is MIA. Turns out each of the X-Hunters has a part of him. In each level there is an optional door leading to a boss fight with one of the X-Hunters: Agile, Serges, or Violen. Beating these bestows X with one of Zero's parts. The catch here is that the X-Hunters randomly show up on the stage selection screen, and they switch locations when you complete or exit a given stage. And if all eight initial Maverick levels are completed before Zero's parts have been retrieved, you're out of luck. Perhaps there's even a capsule to give X a shoryuken move. Mega Man X2 and the X series itself are a lot like classic Mega Man. The game is an action-platformer, has X facing eight Robot Masters, and has all the futuristic fun you'd want. However, X has plenty of alterations. He can scale walls, dash along the ground, earn aforementioned upgrades to his health and armor, and can charge not only his X-buster but also-- with an armor upgrade-- special weapons as well. If you loved, Mega Man X, you will probably love Mega Man X2. 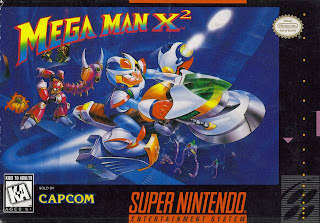 Perhaps a complaint one could find towards the game is that while the original X moved the Mega Man formula forward, X2 sort of toes the line and doesn't stray far gameplay-wise from X1. I am of the mind that I dig more of the same in this instance, and in some ways I find X2 to be an improvement over its predecessor. 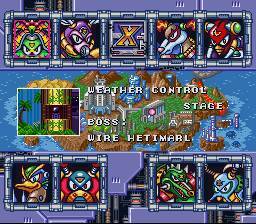 Impeccable level design is a must for these types of games, and Mega Man X2 fits the bill unbelievably. You're taken through all sorts of interesting venues, from alligator-shaped aircraft and volatile volcanoes, to crystal caverns and desert highways. It seems every enemy placement and obstacle serves its own purpose and you understand why objects and foes are where they are. There are seldom, if any, blind jumps or cheap parts to the game. Finding hidden goodies gets to the point where you can develop a sixth sense for how the makers of X2 think and uncover secrets without the assistance of a guide. 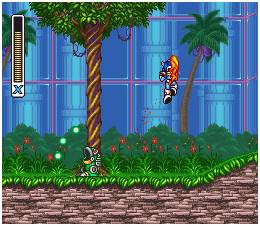 Mega Man X2 obviously uses the same engine as the 1994 original, so you won't be blown away-- Though the vistas, backgrounds, and characters are all nice to gaze upon. However, the graphics team at Capcom didn't rest on their laurels. 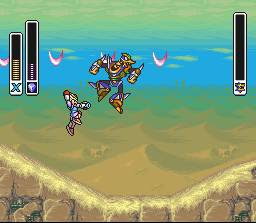 For both Mega Man X2 and its sequel, they used a special cartridge allowing for wire frame effects as seen in the title screen, a mid-boss encounter in the Central Computer stage, and a later portion of the game. While I think more could have been done with the technology, it is a cool effect to witness on the old Super Nintendo. The soundtrack is quite good, rivaling Mega Man X's music in memorability and being catchy. Sound effects like buster shots reflecting off walls and enemy shields cracking sound a bit authentic as well. This first boss may look big, but he's a pushover. So I know you're dying to find out which is superior-- Mega Man X or Mega Man X2? Well, I'm going to go the neutralist's way and suggest that both are X-ceptional for different reasons. While Mega Man X is more challenging, more revolutionary to the Mega Man franchise as a whole, and has the more unforgettable levels, Mega Man X2 has better hidden secrets and a more engaging story. You can't go wrong with either title, and they are both available on the Wii's Virtual Console or within the Mega Man X Collection on the PlayStation 2 or Nintendo GameCube. Or you can get the authentic article and score a Super Nintendo cartridge of the game. Either way, Mega Man X2 is one game that X-cels at what it sets out to do.